We’ve all been on that Holy Grail, haven’t we? Of finding that perfect fry pan that can cook evenly, last longer and use the bare minimum of oil. It should also be oven friendly and light enough to toss the ingredients if needed. So we all go through many an anodized, non-stick coated pan and cast-iron pan through the years. Still, the search continues. Cast aside the cast irons and the non-stick pans, what you and your kitchen may need is a carbon steel pan. And not just any carbon steel pan, go for the best carbon steel pan that suits your needs as well as pocket. What Is Seasoning A Carbon Steel Pan? Carbon steel is an alloy made of iron and carbon. It has little to no values of other alloying elements such as tungsten, chromium, manganese or cobalt. This makes carbon steel a little more corrosive than stainless steel. Once you cook in your carbon steel pan, you will notice staining and yellowing of the same. That said; this staining is harmless. The carbon ensures better heat distribution, better malleability, and durability as well as a lower melting point. This means a carbon steel pan may not look as shiny as a stainless steel one but will cook better and more evenly. It is also light enough to be handled with ease. The thing about carbon steel pans is that they are a little heavy on maintenance and the pre-use seasoning (more about seasoning later). They do demand a bit of your time to work right. However, once you do decide that cooking better food is worth that mild inconvenience; these are the best carbon steel pans around in the market today. Available in many sizes, from a basic 8 5/8-inch to a 17 3/4-inch, these gray pans from Matfer Bourgeat are surprisingly heavy for their size. Though they are lighter than the traditional cast iron equivalents. They need seasoning if you want them to be non-stick. These heavy-duty and long-lasting pans can be used on the stovetop, on the induction and even on outdoor grills and barbecue for cooking. The smaller ones can fit into the oven with ease as well. The handle is very strong and doesn’t get loose or wonky over time. With a wide range of sizes, you can choose the pan as per your needs. The pan is made well overall and with correct usage should last long. It is very oven-friendly as well. It also works on just about every stovetop type so you don’t have to think too much once you get it, and may prove to be the best carbon steel pan for you. Removing its natural coating and then seasoning it to turn it non-stick is a bit of a headache. If you follow the instructions that come with it, it should work fine. The heaviness can be a bit of a detriment if you like tossing your veggies often. Also, very high heat can warp the pan – so gradual heating works best. Don’t just put the pan on high heat. Start it off on a simmer and gradually bring to a boil – whether you are seasoning it, or cooking in it. This one is a very heavy duty carbon steel pan that’s available at a rather reasonable price. The Paderno pan also comes in different sizes ranging from 7 7/8-inch to a really large 19 5/8-inch. Again, if you want to use it as a non-stick pan, you have to season it. This particular pan also has to be seasoned repeatedly to really get it to a non-stick stage. It could be the best carbon steel pan for you because it has excellent heat conduction and can sear like nothing else. It’s also pretty lightweight so comes in handy for those who love to toss their cooking. It fits well into an oven too. High heat doesn’t seem to affect it all that much so this becomes the perfect pan for searing just about anything that strikes your fancy, be it steaks or fish. It does have a good quality-to-price ratio so it will prove to be an economical buy for you. The one point of woe with this pan is the handle – it’s may need an additional silicon sleeve for a better and a more comfortable grip. The handle isn’t flush with the pan either and you will need to clean this pan with a keener eye than usual. Otherwise, you will get that oil and leftover food goop stuck in and around the rivets. Also, liquids can leak out of the rivets over time. This is why a silicon sleeve for the handle is not only better, it is recommended. It is also not dishwasher friendly so remember to clean it after every use. The most amazing thing about this particular pan is that it comes pre-seasoned. So it is the best carbon steel pan for the carbon steel newbie. This means you do not have to spend hours applying the oil and heating the pan to a carbon black color to turn it non-stick. An entire headache has already been taken for and off you. You can simply start using this one just like any other non-stick frying pan around. It comes in four sizes: 8-inch, 10-inch, 12inch, and 15-inch so can fulfill any and all family cooking needs. The seasoning for the Lodge Skillet has been done with soybean oil. Since the oil has been burnt off, it should be safe for anyone with allergies to it. However, it’s best to check the fine print out. Since this takes away the headache of seasoning, it’s a delight to use for the carbon pan newbies. It can be used just about everywhere except the microwave. It retains heat very well at any temperature so ends up cooking everything to perfection. The pre-seasoning ensures it doesn’t retain any odors as well. If used as per the accompanying user guide, this pan can last you a long time to come. Remember though, the seasoning will wear off after prolonged use. You will have to season it again for it to be used a non-stick pan. Else everything will just stick to the pan and end up a crumbly mess. The handle is a little too long for comfort and it does get hot sometimes. Silicone sleeves don’t work on this one much so it’s best to don oven mitts before grabbing it off high heat. Also, the bottom isn’t quite flat, so even searing can become problematic sometimes. Authentic paella pan. made in spain. Safe for stovetop, oven, or grill. Ideal for serving 3 to 5 people. 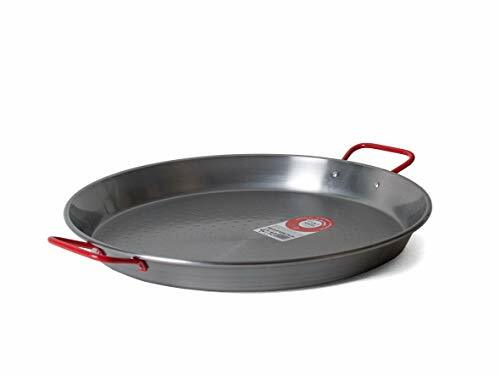 So this one comes in just one size and as the name suggests, it is the perfect pan for making paella! Of course, it’s also a great pan to make a pizza or roast some chicken or grill some vegetables. You get the idea, right. It’s simply a great pan. Unlike the other pans that come with one long, handle; this one is equipped with two smaller ones on the side. You don’t flip this pan; you gently turn it on the heat instead and use a spoon or ladle to work the food around. The pan may look thin but it is over two pounds in weight and cooks any rice dish to heavenly perfection. It comes equipped with a pamphlet that has two paella recipes (which are quite fabulous by the way) and detailed care instructions. Follow the instructions and you have a rust-free pan for life ready to cook you the best of foods at short notice. It’s big enough to cook for 3-6 people, depending on appetites. It also conducts heat beautifully despite a few hotspots. For the paella lovers, this is the best carbon steel pan in town. The problem areas are the handles whose plastic coatings tend to melt off when exposed to high heat. This won’t happen on a stovetop or in the oven but might if cooking on an outdoor flame, grill or barbecue. Another issue is the high level of maintenance it requires. Even in the beginning, you need to scrub it with plenty of hot water, soap and a 3M scrub pad to get rid of the coating it comes encased it to prevent any rusting. You will need to wipe it immediately after it has cooled and then dry it with alacrity or else it will rust. Available in five sizes from 8-inch to 14-inch, the Maviel M-Steel Pan is made in France and boasts of extra-thick carbon steel in black. The best thing about this pan and all Mauviel products is that they come with a lifetime guaranty against all manufacturing defects. So this is the best carbon steel pan to last you all your cooking years since the company itself has committed to making products that are the best there are. The pan is made from black carbon steel but will need to be seasoned before use. It has been built to withstand high temperatures and will not warp or bend even at the highest heat setting you put it on. It’s lightweight and can be used to cook on or in anything. Plus, it is built such that anyone can comfortably use it and churn out one great dish after the other. It’s durable if seasoned right and with proper maintenance can last you a good many dishes. Meaning it is the best carbon steel pan for those who love to cook and sear. Removing the protective beeswax is a bit of a hassle. The process is not very difficult but it does take time. It makes it a bit of an oddity in the out-of-the-packaging and onto-the-flame coated pans of nowadays. But with a little time and patience, it can be done. Also remember, this pan is not seasoned and will need to be worked on to give it that non-stick coating. Take care of the pan and it will work like a charm but if you do not maintain it, it will eventually rust. Now, you must have read the word seasoning a lot of times, and the fact that carbon steel pans can be bought pre-seasoned or unseasoned. The non-seasoned ones come coated with stuff that has to be removed. Then they need to be seasoned to turn them into non-stick pans equivalent to coated or anodized ones. Sounds complicated, right? It isn’t, and as a firm carbon steel pan convert, let me give you the best carbon steel pan 101! So seasoning a carbon steel pan isn’t the same as seasoning a dish. It isn’t adding all those mouth-watering spices or aromas to the dish you cook in the carbon steel pan. It’s a way of naturally creating a non-stick coating on the pan, also called a patina. The coating will make it function as well as any anodized or Teflon-coated non-stick pan. Remember, if your pan is pre-seasoned, you don’t need to season it initially. Just give it a hot water wash, wipe it down with paper towels and you are ready to cook in your awesome new carbon steel pan. For unseasoned pans, this is what you do: wash down your unseasoned carbon steel pan with loads of hot water and dish soap. This is the only time you will be using soap on your pan. You may need to give it a good scrubbing to remove the waxy protective coating on it with a good scrub brush or pad as well. After, thoroughly rub it dry with paper towels. If your pan comes with instructions on how to remove the coating, follow that instead. Method 1: Once the pan is dry, put it on low heat on the stovetop. Now add 1/3 cup sunflower or vegetable oil, 2/3 cup salt, and peels from two potatoes. Cook this over medium heat and move the peels around the pan to keep coating the sides to the rim. After about 10 minutes, the pan should have turned brown. Switch off the heat and discard the contents. Wipe down the pan with paper towels. This should have turned the pan non-stick but if it doesn’t, repeat once more. Method 2: If the above method sounds a little alien, try this instead. Once the pan is dry, put it on high heat on the stovetop. Let the pan blacken and smoke, then turn off the heat. Using tongs and mitts, apply vegetable oil or shortening to the pan, thoroughly coating the insides but not to a drippy extent. Make sure the pan has a sheen, that’s it. Now put it back on high heat till the oil starts to blacken again, wiping away any excess oil beading or pooling in the pan. Once the pan seems evenly black, turn off the heat and let it cool in a safe place, away from hands. Once cool, wipe it down with paper towels and get cooking! You can season a pan in the oven as well. Preheat the oven to 400°F and put the pan in the oven while the oven is preheating, 10 minutes or so. Remove the pan from the oven, and remember to use the mitts. Drop some oil onto a clean dishcloth or paper towel and spread it all over the pan, inside and out, using tongs and mitts to prevent burns. Layer a baking sheet with tinfoil and place it in the oven on the bottom rack. Place the oil-coated pan on a rack above the baking sheet and cook the pan at 400°F oven for one full hour. The baking sheet will catch any oil drips while your pan slowly blackens to become a non-stick one. Once done, turn off the oven and let the pan cool completely. Remove and wipe down with paper towels. Get cooking. Once your best carbon steel pan is seasoned, it will not be meeting dish soap again. To maintain it for prolonged and healthy life; keep it away from abrasives. Every time you cook in it, let it cool and rinse it out with plenty of hot water. Immediately after, dry it with plenty of paper towels and apply a thin coat of oil again to store till you use it again. If the food starts to stick, start again with step 1, following whichever seasoning method suits you the best! Reseasoning the pan is a continuous process and will make your best carbon steel pan last you many a year. The seasoning sounds like a ton of work, right? It is. But there are benefits to cooking in a carbon steel pan. The simplest benefit of it all is that these pans, especially the best carbon steel pans distribute the heat evenly giving you the perfect dish after dish. They also retain heat well thus becoming the perfect pans for searing and crisping up meats and grilling vegetables. Once you season it and turn it non-stick, you’ll need to add very little oil to cook your dishes. Plus these pans are economical and last a long time to come. Seriously, it’s the seasoning – its time consuming and the not the easiest thing to do. Plus with the pans getting so hot while seasoning, there’s the risk of burns as well. You can always buy a pre-seasoned pan, but sooner or later you will have to re-season it. Even the best carbon steel pans aren’t dishwasher safe. So washing them in plenty hot water (spare the soap) and wiping works best. Highly acidic foods such as vinegar and tomatoes will also break down the patina or the non-stick coating of the pan. Also, improper maintenance will make it more susceptible to rust and corrosion so these pans need good care. So if you are sold on the idea of getting yourself the best carbon steel pan, these are the best brands to consider, in random order. Matfer Bourgeat: Matfer Bourgeat is a French company that has been in the US for 25 years and counting now. It has been in business for over 200 years though! So this two-century-old company has become quite the leader in personal and professional kitchens all over the world. Mauviel: Mauviel is another French utensil brand that was established in 1830 in Normandy, and the name comes from the founder. They make awesome carbon steel pans among other stuff. DeBuyer: DeBuyer is yet another French brand. This should give you an indication that carbon steel is quite the favorite with the French, famous for their culinary skills! They make kitchen utensils in carbon steel as well as cast iron, stainless steel, and copper amongst other things. Lodge: In 1896, a Mr. Lodge and his wife settled in the town of South Pittsburg, Tennessee and opened his first foundry that made cast iron pots and pans. From then till now, Lodge has been making awesome pre-seasoned cast iron and carbon steel pans, perfect for carbon steel beginners. Paderno: A Canadian brand, the first Paderno manufacturing plant as opened in 1979 and is still operational to the day. Other than carbon steel cookware, Paderno also makes bakeware, kitchen tools, serveware, and even kitchen textiles. Q: What is the difference between pre-seasoned and unseasoned carbon steel pans? A: Pre-seasoned carbon steel pans are ready-to-use. The manufacturer seasons these pans so they can straightaway be put on the flame after a wash, much like any non-stick cookware. Unseasoned carbon steel pans need to be seasoned with any of the methods mentioned above to give them a non-stick patina before you start cooking on them. There is no difference in quality though. 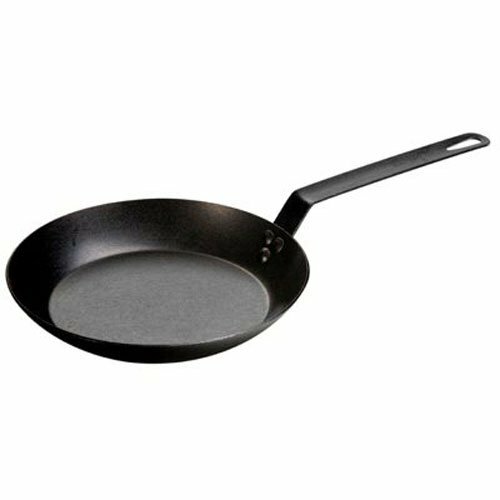 Carbon steel pan newbies can choose the best carbon steel pan they like that has already been seasoned by the manufacturer. Q: Are Carbon Steel Pans As Non-Stick As My Non-Stick Cookware? A: Almost. Most carbon steel pan users have no problems making things like eggs or grilled meats on their well-seasoned carbon steel pans. But remember, even the best carbon steel pans will turn sticky if their patina is wearing off. Improper maintenance will also cause corrosion. If a carbon steel pan is seasoned right and is not rusted or corroded from anywhere, it should be fairly non-stick. Even if it isn’t as non-stick as the Teflon-coated pots and pans. Q: What Happens If The Seasoning Wears Off? A: If the seasoning wears off and your cooking starts to stick, you need to start over. What you need to do is re-season the pan again. Scrub off all the sticky part of the patina till the pan is smooth to touch, even if it looks discolored. Then season using any of the stovetop or oven methods mentioned above, and you’ll get your best carbon steel pan to become an awesome non-stick one again. Q: Are They Pricey Or Economical? A: Compared to a Teflon pan, they are more expensive. But they are cheaper than cast iron pans. The thing is, they are more like a one-time investment than something you need to change after the patina wears off, much like you need to do with the non-stick aluminum pans. I have used most of these carbon steel pans and till date, the Mauviel M’teel Black Carbon Steel pan has worked like a charm for me. I prefer seasoning on the stovetop instead of the oven, using the oiling method rather than the potato peel one. The Mauviel pan has been in my kitchen for three years now, and I have seasoned it about five times, including the first seasoning. This may sound too often but I live in a humid climate so the seasoning tends to wear off even when not in use. Many find the Lodge pan a little too light to use. But for the carbon steel newbies, it’s an excellent choice since it comes pre-seasoned. Use it right and maintain it well and the seasoning will last you a good six months before wearing off. Time enough to make you fall in love with the whole carbon steel pan cooking concept. Reseasoning it will not be that big a drag if you already love the pan, right? 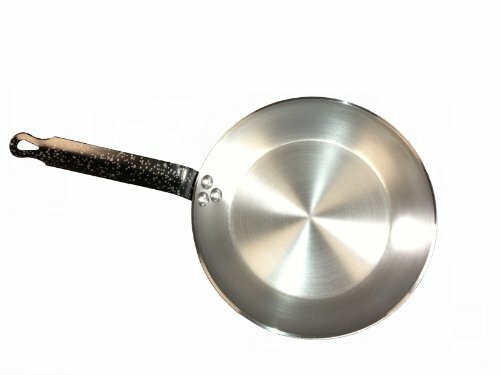 Ultimately, the best carbon steel pan is the one that suits you and your needs the most, so check handleability and reviews before you make your final choice. Seasoning and maintaining the best carbon steel pan may sound a little time-consuming, but the cooking results are well worth it. Happy cooking to you, in your choice of the best carbon steel pan.